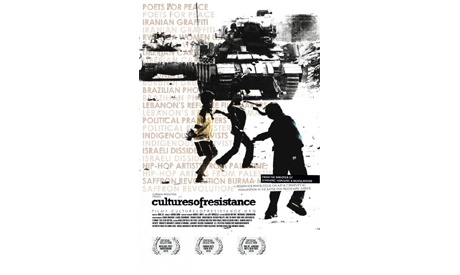 Cultures of Resistance directed by Iara Lee, exploring resistance through art around the globe, will be screened Tuesday 17 January at the Townhouse Gallery of Contemporary Art in Cairo. The film sheds light on different conflicts around the world, whether it’s occupation, economic injustice or environmental issues, as it goes from Liberia, to Palestine, Burma, Columbia, Iran and Brazil. The film features the political pranksters Yes Men in the United States who published a fake edition of the New York Times announcing the end of the wars in Iraq and Afghanistan, hip-hop musicians in Palestine, a Liberian cartoonist, Buddhist Monks in Burma and the Iranian graffiti artists Teheran Rats, among others. The film is currently on a global tour, including screenings at film festivals in Africa, Asia, Europe and the Americas. The screening will start at 7pm in the Townhouse Library, 10 Nabrawy Street, off Champollion Street, Downtown Cairo.